From first-hand experience, I know that the nutrition from the food I eat has a direct impact on my physical and mental performance every day of my life. Staying away from animal products that used to make me feel sluggish and often cranky I focus on more fruits, veggies, grains, nuts and seeds – whole foods that help me stay alert, fit and healthy. 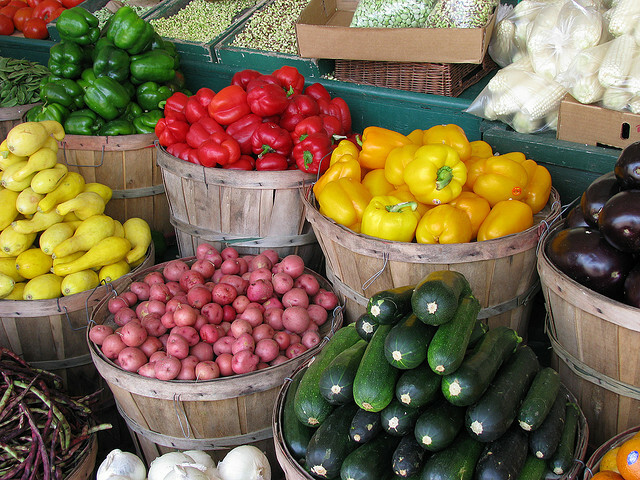 Summer is the perfect time to get in those wonderful veggies and fruits – if you’re unable to grow your own produce, shop where the produce grows by checking out your local farms. 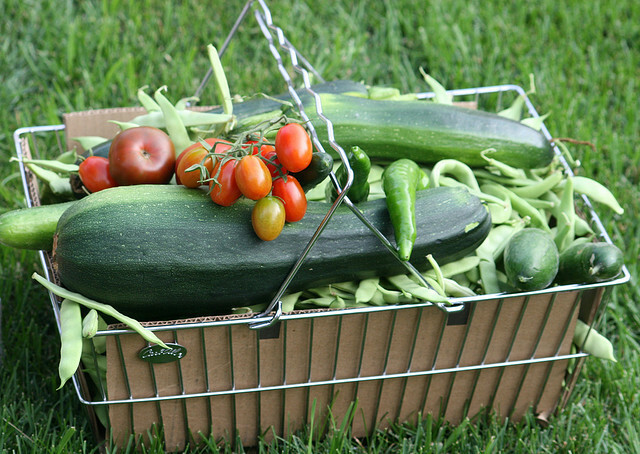 Many have u-pick options so you can take things home to can or freeze to use in the future. And nothing is more fun that walking through your local farmers market. 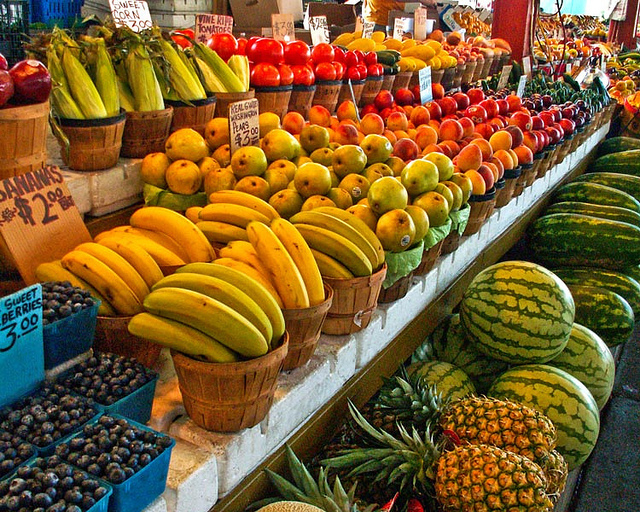 So many areas now sport local farmer’s markets. 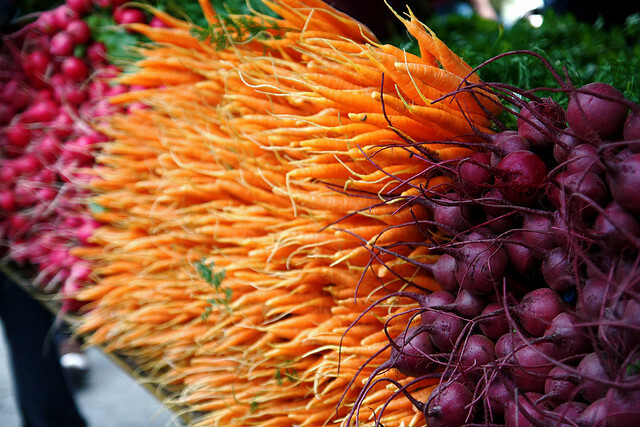 For a PDF guide to the Farmers’ Markets in Oregon, click here. Plus summer is the time to have fun with your food! 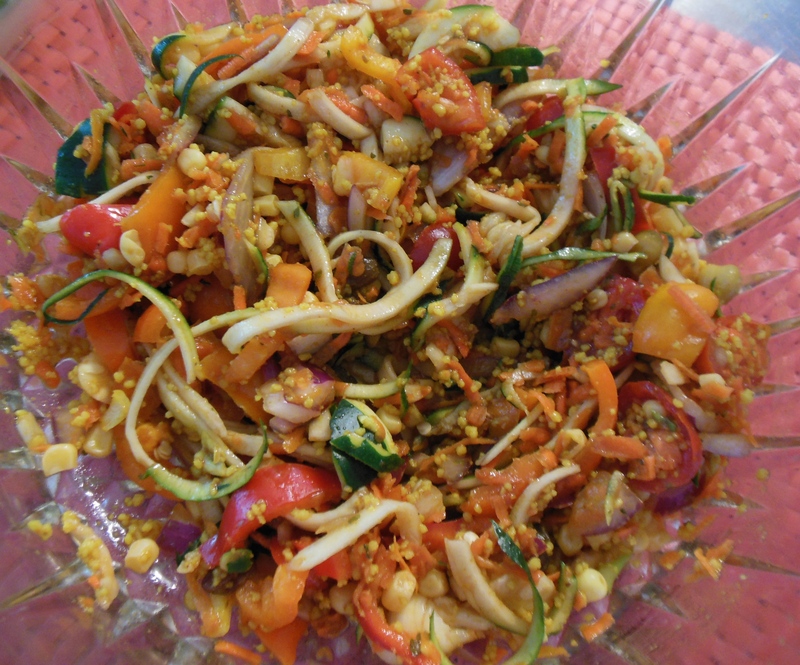 On a recent visit with my sister, she introduced me to a wonderful little gem called the Spiral Vegetable Cutter. It is the greatest tool I’ve used lately, and it’s going to be a delightful way for me to get in some more veggies in a fun and creative way! You have to try it. You’ll love it! For the past few days I’ve been zoodling! 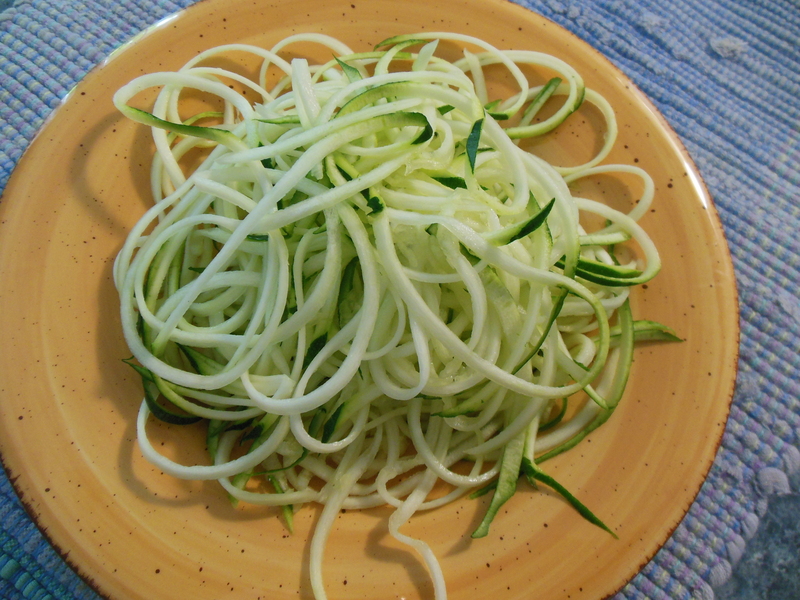 Taking zucchini (and we all know there will soon be a wonderful over abundance of this veggie) and making zucchini noodles. 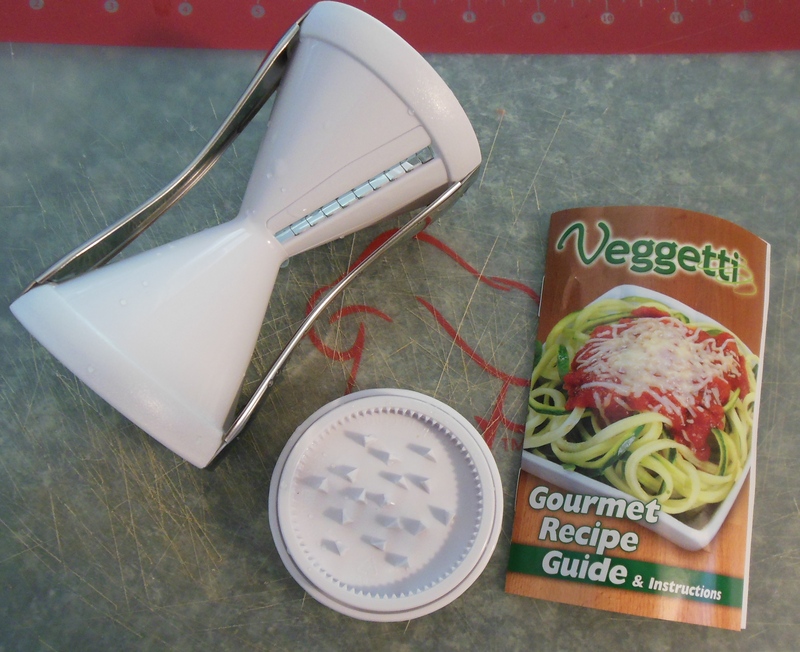 I know there are various ones on the market, but the gadget I’m using is called the Veggetti Spiral Vegetable Cutter. 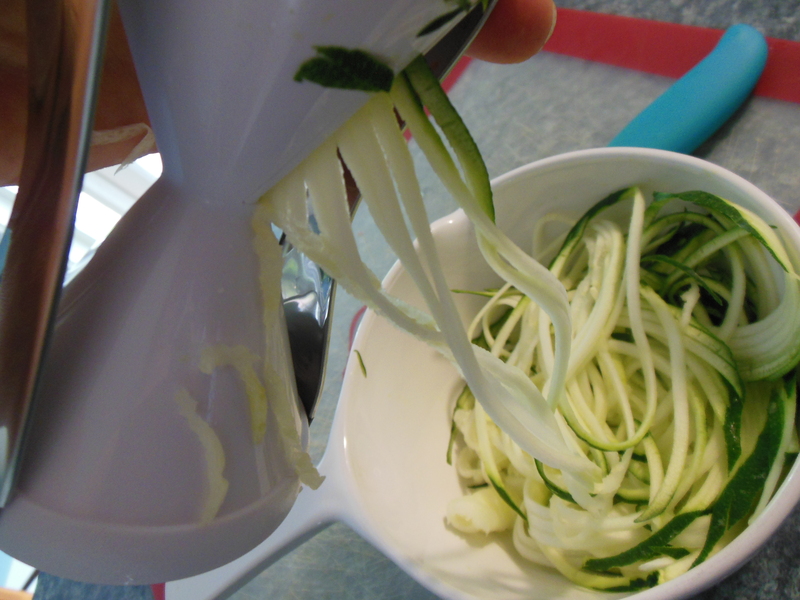 It’s the perfect size, reasonably priced, and is easy to use twisting out mounds of zoodles in seconds!. I got mine at Bed, Bath and Beyond, and I see it’s also available on Amazon.com. 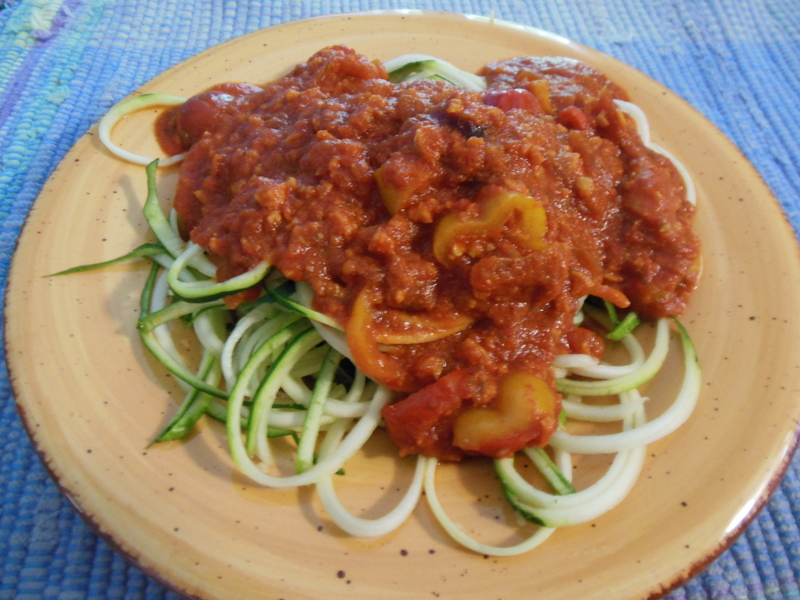 It also works great on squash, carrots, cucumbers and potatoes for veggie spaghetti, juliennes and stir-fries. I’ve found that vegetables about 2 inches in diameter work best. There are dual stainless-steel cutting blades for thick or thin pasta strands. I’m definitely going to have fun with this. 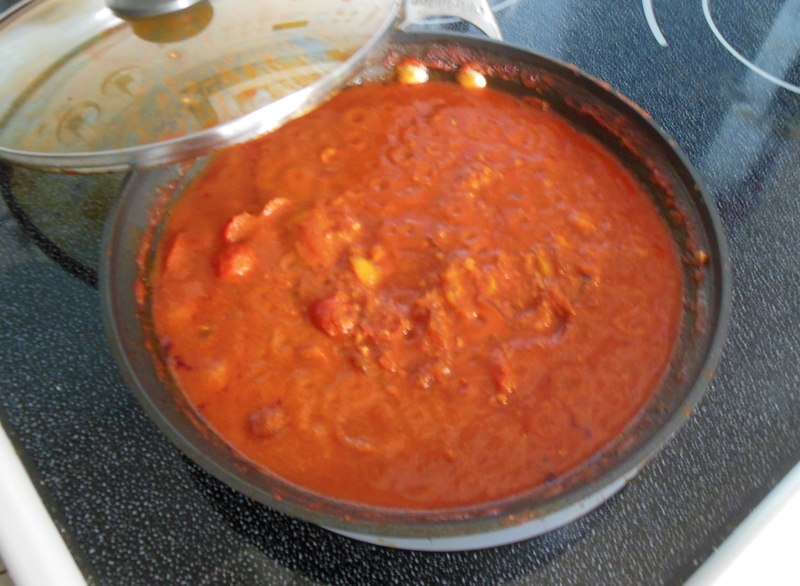 For a super simple dinner I simple warmed up a pre-made marinara (I like Kirkland’s because of the low sugar and short ingredient list: Made from vine-ripened California tomatoes, extra virgin olive oil, fresh garlic & basil). I did a quick saute of some extra onions and peppers (I like mine very chunky) along with 1/4 cup TVP (great protein) and it was a delicious, easy supper. 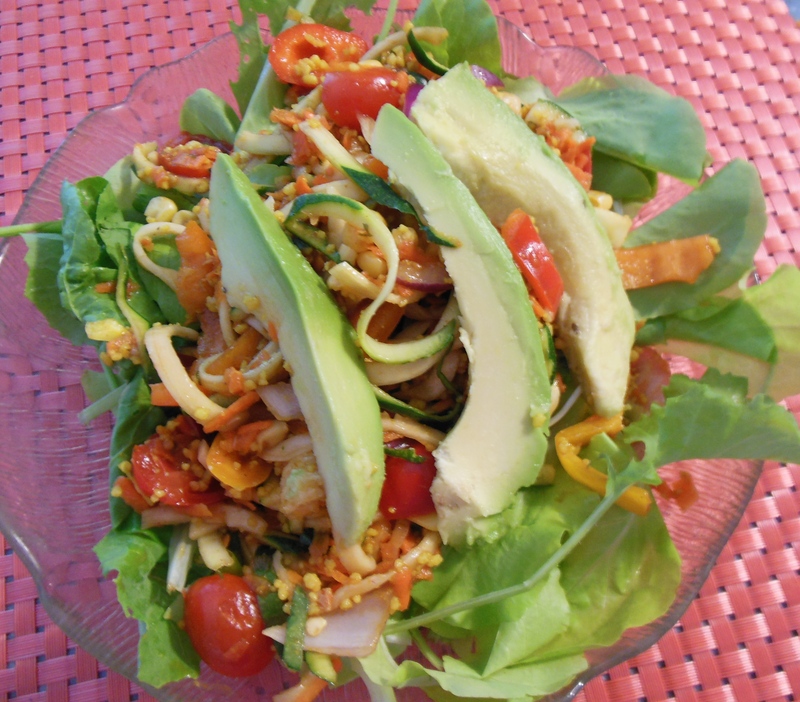 It’s also a great tool for making a gorgeous salad. Be creative! I just threw together some different veggies I had in the fridge, added some left over curried couscous and added some red wine vinegar. This beautiful salad on a bed of fresh greens from my co-workers garden and YUM!! What a super easy, lovely, summer supper! So have some fun! Make stars, or flowers or hearts with your melons! Fruit kabobs are fun and so easy! 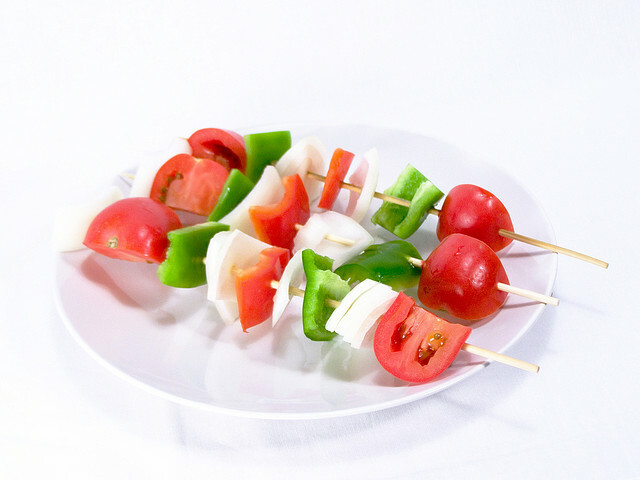 Make veggie kabobs and grill them on the barbecue! Yum! 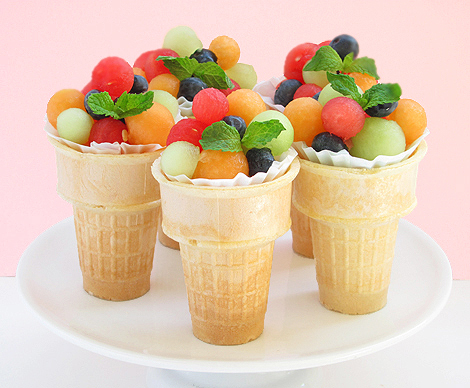 Make fruit salad cones . 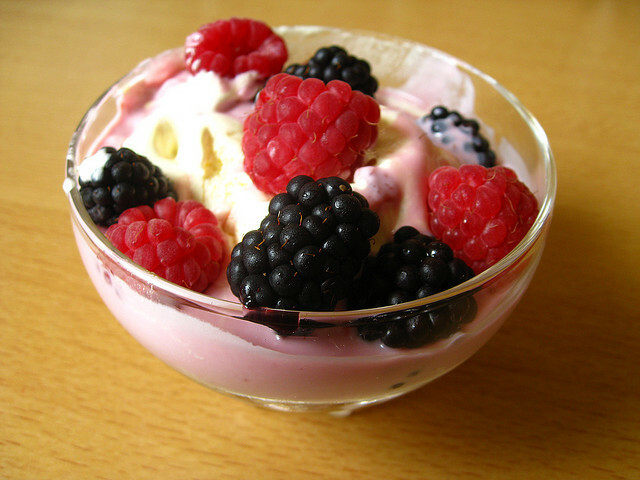 . .
or how about some beautiful sweet berries with some of your frozen banana ice cream! 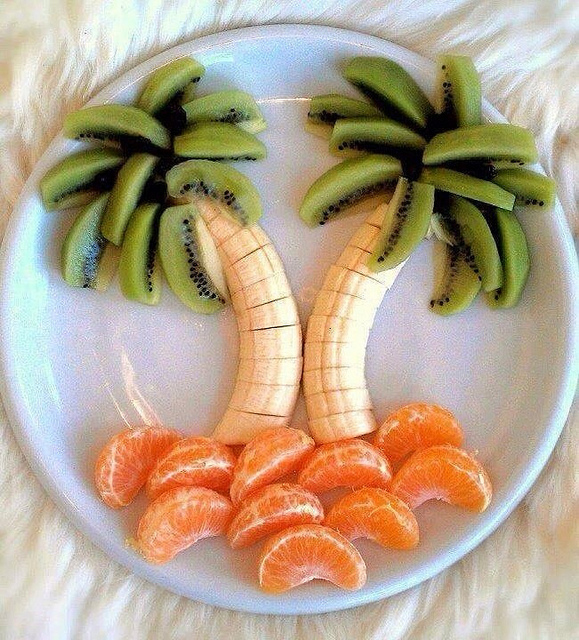 Make palm trees out of your bananas, oranges slices and kiwi! Yes, I give you permission to play with your food! !